This is, essentially, Marvel4's excellent Geonosis: Spire conversion with some different heroes, modes and at least one additional era -- stock Galactic Civil War, featuring Wedge Antilles as a hero and an excellent Grand Moff Tarkin, as rendered by AQT. 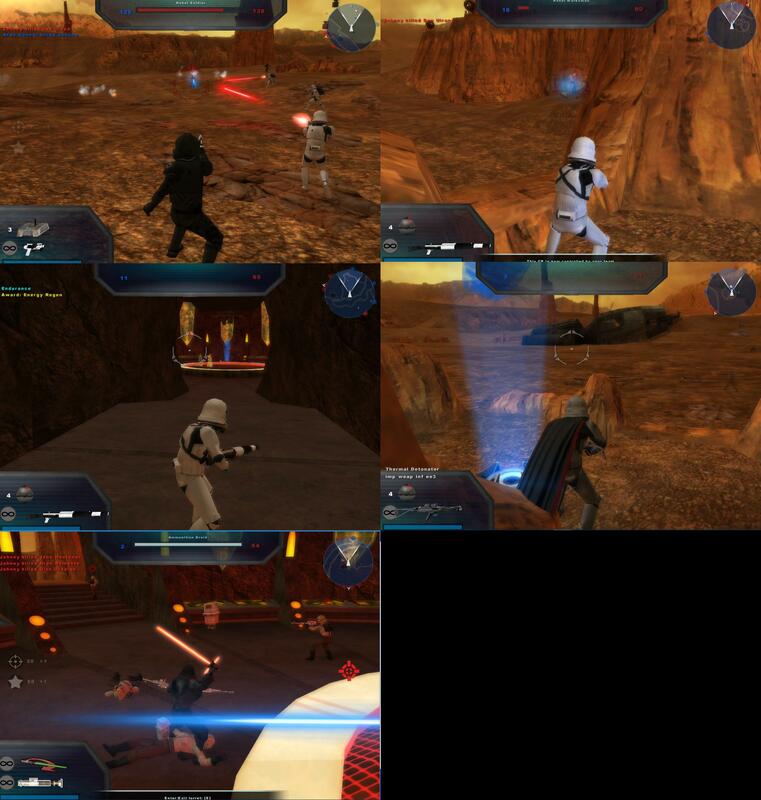 Hero Assault features some custom characters from the conversion pack as well as Tarkin and Gizor Delso. XL has been exchanged for Uber mode. I've been doing a lot of edits for private use but asked Marvel4 for permission to make this one public since I felt the additional Galactic Civil War mode could be interesting to some people, particularly less-experienced or non-modders. The map is already playable and can basically be released at any time, save a few bugs in GCW Hunt, but I'm adding a custom era or maybe two. I do want to keep the mission count low and will cut modes if there are too many eras, or vice versa, but I do want to make a little more of a mark. Accepting any suggestions for alternate CW heroes (to differentiate more from Geonosis: Plains) or for alternate eras/units -- or suggestions in general, really. Just remember I have no access to world assets, nor does my ZE work right now. January 3rd, 2017: Work resumed. 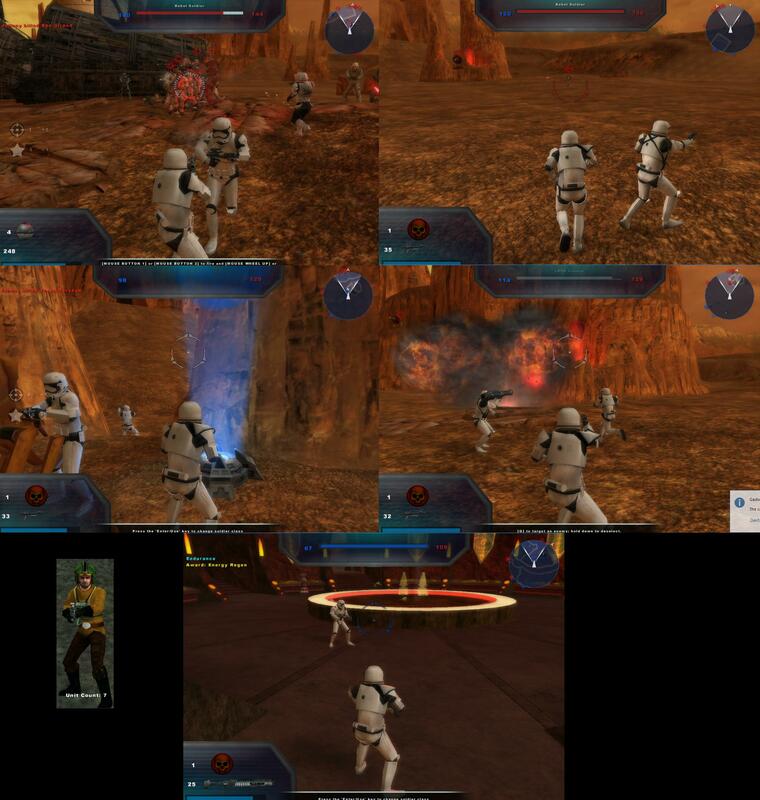 Revealed new unit - Geonosis Trooper, Phase II - for possible inclusion in Clone Wars Uber mode, finally completed. February 28th, 2016: Revealed four custom units for Galactic Civil War Uber mode - Rodian Smuggler, Mon Calamari Officer, Sullustan Commando, and a Storm Commando, with thanks to the Conversion Pack Team, Devis, Flippy11, the BFX team, and tirpider. February 27th, 2016: Revealed Hero Assault mode for Galactic Civil War 2.0 era, featuring several custom heroes by Delta-1035, in addition to the stock Boba Fett. February 21st, 2016: Revealed fully playable Galactic Civil War 2.0 era, with thanks to Delta-1035. February 1st, 2016: Revealed Grand Moff Tarkin hero, with thanks to AQT. He's fully ingame and just needs final tweaks, replacing Boba Fett. January 31st, 2016: Public announcement. See above. As more updates come, the above ones will be moved here. Last edited by BF2-Master on Tue Jan 03, 2017 2:04 am, edited 4 times in total. Thats actually pretty cool. You could do some really cool stuff with some custom units. For alternative units for cw I would suggest some kind of clone commando unit seeing as they were present during the invasion. 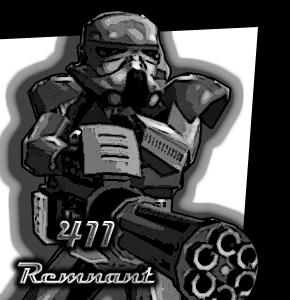 For the GCW maybe a similiar thing with a storm commando. What gameplay style were you going for in terms of custom units? TWINKEYRUNAWAY wrote: Thats actually pretty cool. You could do some really cool stuff with some custom units. For alternative units for cw I would suggest some kind of clone commando unit seeing as they were present during the invasion. For the GCW maybe a similiar thing with a storm commando. What gameplay style were you going for in terms of custom units? Thanks! I'm still figuring out what style to go for -- I've always kind of preferred larger battles. Commandos would definitely be a solid and fun addition. Looks pretty nifty so far but as Twinkey said, this could definitely use some custom sides. I am a very big fan of custom sides or "new units" as long as a different skin is used. I feel if someone puts so much hard work into a map, no matter how little or how much, they should make an effort in at least making one custom unit for each team to show some love to the units. I'm already working on some custom units behind the scenes -- nothing worth showing yet, unfortunately. Still very open to suggestions! 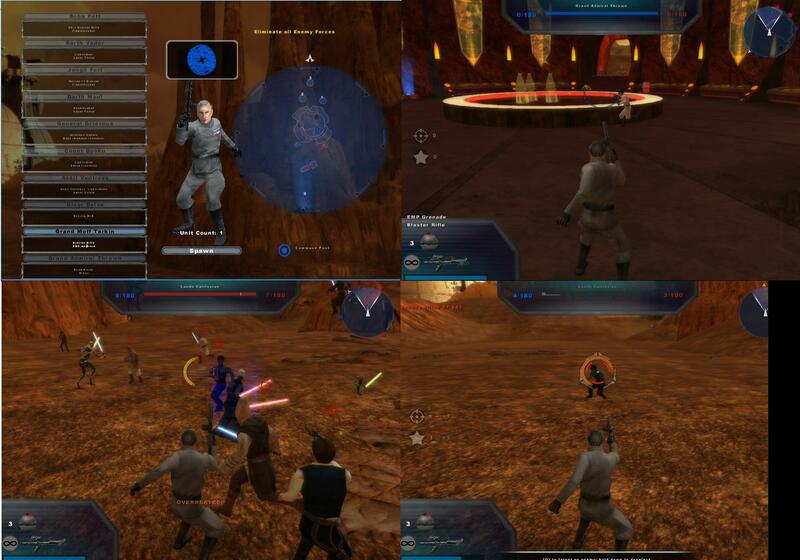 In the meantime, enjoy a glimpse of AQT's Grand Moff Tarkin ingame - so proud to have this guy ingame. Still tweaking weapons. Anyways thanks for creating this map! BF2-Master wrote: In the meantime, enjoy a glimpse of AQT's Grand Moff Tarkin ingame - so proud to have this guy ingame. Still tweaking weapons. Is this a hero assault mode that you took pictures in? I am just curious since I enjoy hero assaults and they seem pretty rare on maps nowadays with custom sides. Sure is -- I couldn't imagine myself making a map without it. Great ideas -- especially thank you for letting me know about the Secret Mission on Geonosis! That's something I'd thought about but wasn't sure was plausible. Nice! 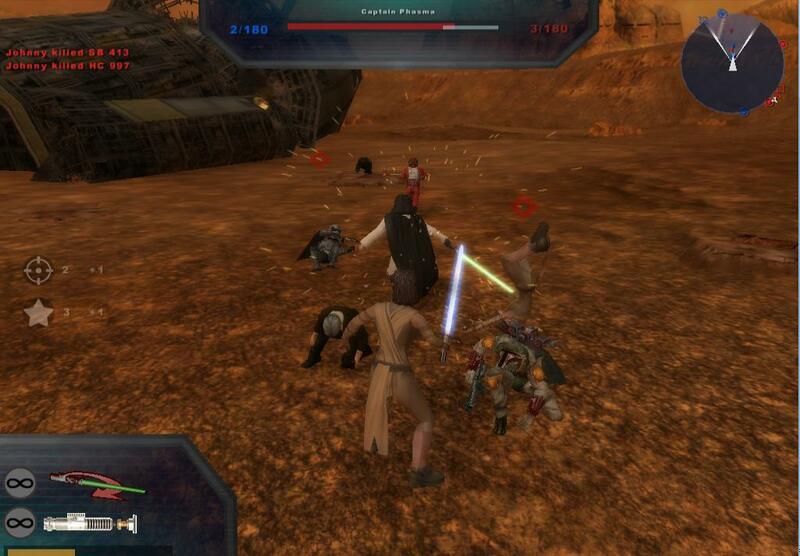 I always wanted to do GCW Geonosis, but never did. One suggestion I would make is to have the rest of the Techno Union ships destroyed. They don't have to be laying on their side like the one is on the REP side of the map, but it provides that feeling that one battle has already taken place here. No problem! I am a huge fan of the comics and the way they tie the prequels w/ the OT, I'd love to see that content ingame. And great job with the Tarkin novel reference! So, a proposal: I really want to stick with main units in Conquest, but I love making customized units... but I don't want to end up with a map with four or five custom eras and inflate the mission LVL, so I'm considering adding custom units to Uber, but leaving Conquest with stock units, so both options are available. How does that sound to people? I'm still tinkering with a custom era separate from modified CW or GCW. Not saying yet because I don't want to make a promise if I can't deliver. I think making the uber mode with custom units is a great idea. If you wanted you could have one model use different backpack add ons and using override textures for very few models to minimize the size for some units. BF2-Master wrote: I really want to stick with main units in Conquest, but I love making customized units... but I don't want to end up with a map with four or five custom eras and inflate the mission LVL, so I'm considering adding custom units to Uber, but leaving Conquest with stock units, so both options are available. How does that sound to people? Sounds good to me, as long as custom units are used, I am happy with the work done on the map. Well of course I care about the map a lot too but I care for custom units more since it shows you put effort into not just the map. The following experiment will not be part of the final map, unless I figure out XSI sometime, but I figured I'd show it off anyway since it's been most of my progress since the last update. Special thanks to ggctuk for the models included. The crappy skin in the bottom left is mine -- I can't use XSI as of yet. Check it out here. This looks really fun, can't wait to play! Great improvment Keep up the gret work! Very nice BF2 Master & Delta! 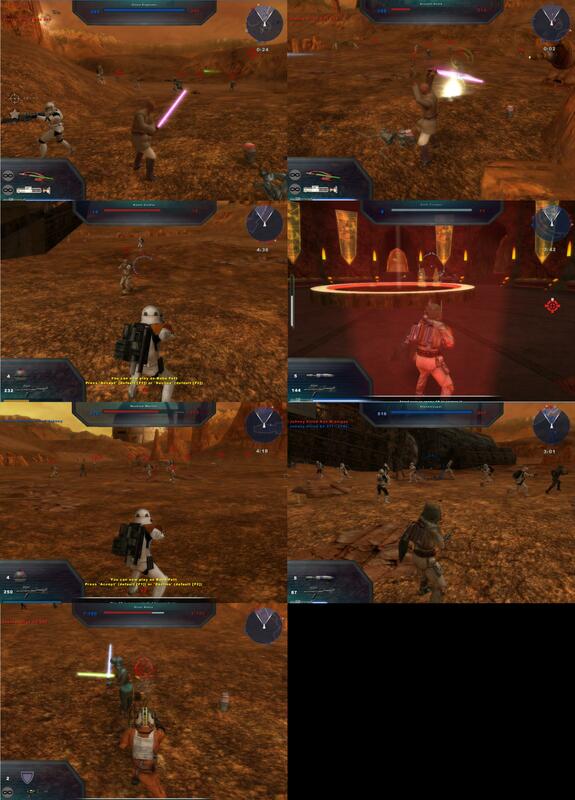 This Geonosis Spire map is definitely going to be the best map when it comes to custom sides and gameplay! You are doing a great job with the custom sides BF2-Master, I do not know how much more awesomeness I can take from this map! We have something new -- thanks again to Delta!